Making it look easy, Josh Jorgenson and Capt. Wes Reeder hook 500-pound goliath groupers like it’s no big deal in the latest episode of BacktipH. The pair set out off the coast of Florida in the latest Youtube episode to show just what’s possible when fishing with balloons. They first start on some bonito using yellow balloons as line floats tied to a baited hook at about 6 feet on 60 pound test. One after another the balloons dart from the surface and they haul in six good-sized bonito. But they aren’t taking these home for supper. 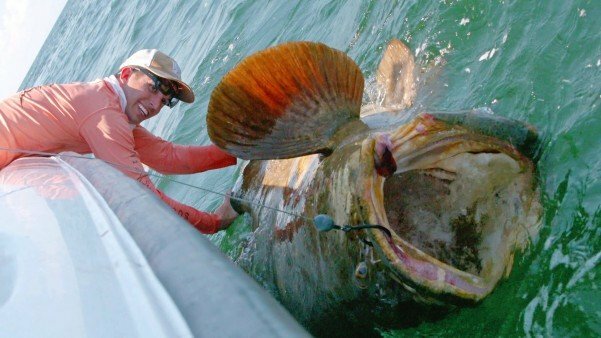 The bonito they caught becomes the bait for some of Florida’s famed goliath grouper. Within minutes of landing on a fishing spot above a wreck they hooked a monster. After a quick yet grueling fight to the boat, they manage to surface this majestic fish of the sea that looks like something out of the ice age. In all, they hooked three of these beauties for a quick catch and release as they are a protected species. In the video, the anglers also commented on the green algae in the water that’s been so prevalent in the news lately.